Wednesday's event was based out of New York City, but the company used the new live streaming capabilities of the Phantom 3 to show scenes from around the world, ranging from Hollywood, Calif., to a spectacular night flight out of a high-rise hotel in Singapore. And to show off the new indoor flying capabilities of the Phantom 3, a drone was flown into the enclosed presentation area in the West Village, where a representative safely landed it on a table onstage. What excited us more than anything, from an Apple perspective, with the new Phantom 3 showcased on Wednesday was a tweaked controller design shown with a Lightning connector. The demo unit shown on the floor was hold an iPad Air, and video was being streamed live from the drone to Apple's tablet. In our previous tests with the Phantom 2 Vision and Phantom 2 Vision+, iOS devices had to be connected to a custom Wi-Fi network in order for video to be streamed from the drone. But it would seem that right out of the box, DJI has eliminated this step with its latest model— a welcome change. 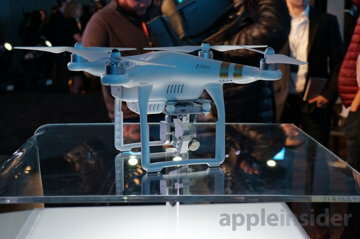 We also came away pleased with the price, as the entry level Phantom 3 Advanced will cost just $999 when it launches later this month. 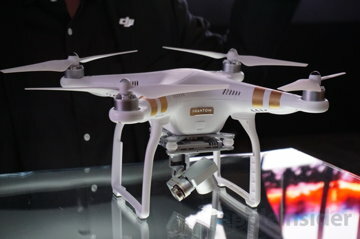 For comparison, the Phantom 2 Vision+, which also uses a three-axis gimbal for spectacularly smooth video footage, was priced at $1,299 when it launched last year. 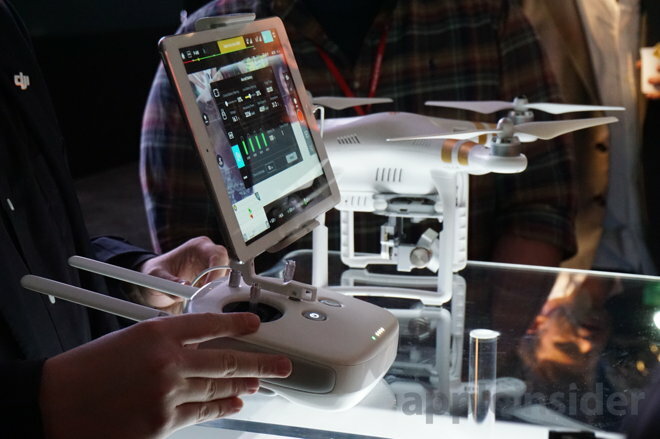 DJI is also offering a more premium "Professional" version of the Phantom 3 priced at $1,259, but the only difference in this upgrade is an improved camera capable of capturing 4K ultra-high definition video at 30 frames per second. For most "prosumer" and casual users, we feel the Advanced model's 1080P HD camera and its 60 frames per second recording capabilities will be more than enough. We're especially glad that the camera appears to be the only difference between the Professional and Advanced models. 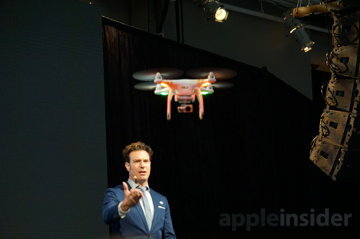 That means all of the new features, including live HD view, instant sharing, automatic video editing, and, perhaps most impressive of all, indoor flying will all be included on the $999 model. 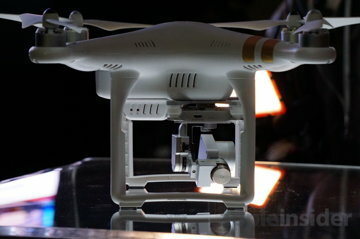 Previous Phantom drones could not be used to fly indoors, as the devices lock their position via GPS for stable hovering and even fighting against wind. But the Phantom 3 now allows stable flight indoors, DJI claims, thanks to a new "Virtual Positioning System" created by the company. 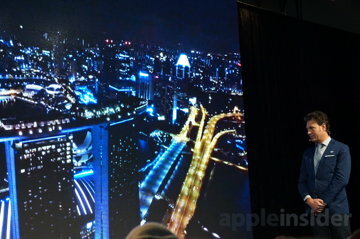 As for the live video stream, 720p HD video is sent out over distances up to a mile thanks to DJI's "Lightbridge" technology. The company says its newest drones will feature almost no latency when viewing the live streaming video feed from the embedded camera. Interesting, most of the changes for the Phantom 3 appear to be under the hood and also in the form of software. 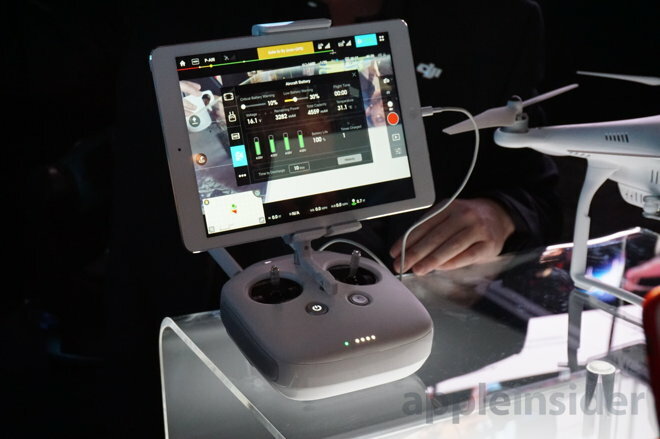 A representative for DJI told AppleInsider on Wednesday that an update to its official iOS app will be forthcoming, enabling new features such as live streaming video to YouTube and instantly editing clips together. The instant-edit capabilities are also tied into a new hardware button on the Phantom 3's remote. This allows pilots to quickly "bookmark" a section of recorded footage, and those favorited portions of the video are automatically edited together. DJI claims that a user can have a finalized video ready to go as soon as the drone lands, using this new feature. The updated DJI iOS app will also feature instant sharing of videos, a live map showing the drone's location, and flight logs for your device. There's even a new flight simulator app that will help users practice without having to send their costly drone to the skies. 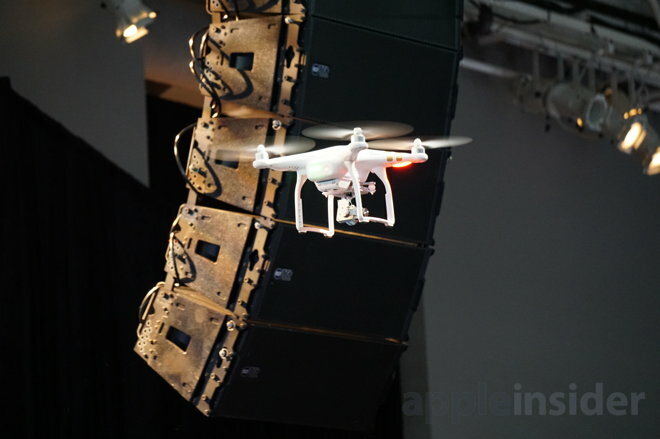 The new capabilities of the Phantom 3 and accompanying app update require an Apple device running iOS 8.0 or later. It will be compatible with the iPhone 5s and newer, iPad Air and newer, and the iPad mini 2 and newer. The Phantom 3 controller also features dedicated buttons for both camera and gimbal control. And previously available functions like auto-takeoff, auto-landing, and auto-return to home are once again included. In terms of flight, the four motors on the Phantom 3 are more efficient, which the company says has led to an increased max flight time of 23 minutes. The Phantom 3 can fly at 16 meters per second, ascends at 6 meters per second, and descends at 2 meters per second. Wednesday's presentation also featured real-life Phantom drone users who spoke about the virtues of the platform. In the most interesting example, a volunteer firefighter from Connecticut explained how a Phantom drone was used to save lives in a highly dangerous blaze where there was risk of a major explosion. 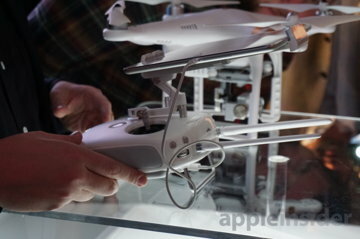 The event wasn't just limited to the Phantom 3, either, as DJI partners were onhand to showcase what they have done with the company's drones through custom modifications. In particular, DJI showed off a drone that has been modified with a custom gimbal and wireless transmission system that connects to the Oculus Rift virtual reality headset. By wearing the headset and flying a Phantom, users can get a sensation of actually flying and pilot with even greater precision. 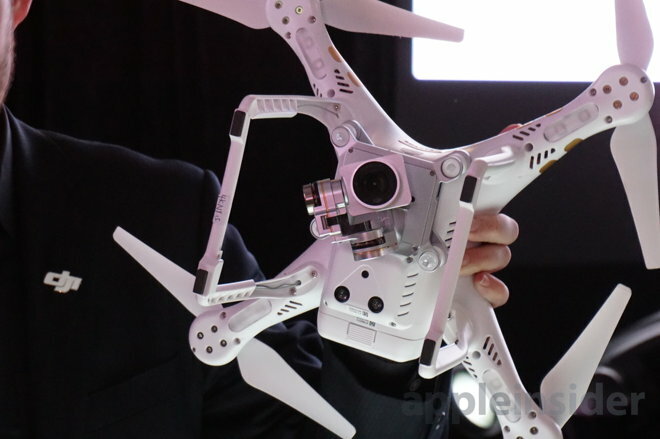 The DJI Phantom 3 Advanced and Professional are both scheduled to begin shipping in the coming weeks. 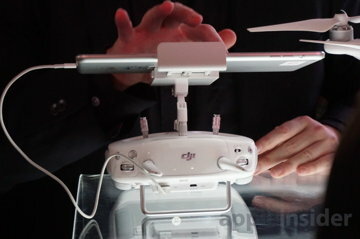 They will be available to order directly from DJI's online storefront.